As I said on the AA A8/5200 Programming Forum I always want to get a way that works and that can really build a more faithfull to the arcade version on A8. Then, Enemys and balls/shots are are software sprites. Now we also have P2 and P3 free that we can haveone or two more colours per each bricks line (even a third more colour if P2+P3 in Multicolour Mode). 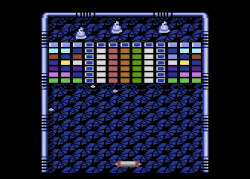 Just need to ask him to free-up PM0+PM1 Multicolour on some scanlines so that we can have the animation sequence of the enemy spaceship comming and destroy that 'our ship' top circle and then the Paddle/Vaus goes out into space. Edited by José Pereira, Fri Nov 15, 2013 9:37 AM. 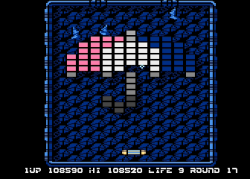 The Apple IIgs, MSX and NES versions are more arcade-accurate than the ones you showed but damn, that's a definite improvement. 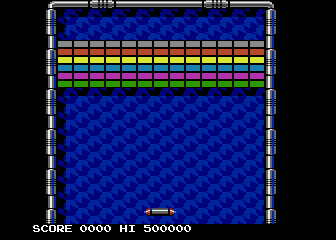 No they aren't and the reason is that because of the screen taller size they went into putting the status at the right side and this result in having only 11bricks per line where ours, C64 and CPC have like the original arcade version 13bricks. And the screen top status on top and number of still available Vaus images at the bottom are more faithfull to arcade version. I have thought about an improved remake of Arkanoid in the past also. 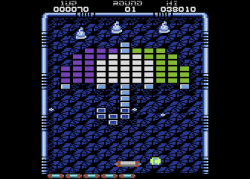 The commercial release by Mike Hutchinson was not too bad but the game could certainly be done visually better. 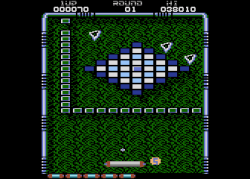 Some of the backgrounds were too bright and made gameplay difficult and the low-res pmg ball in particular was a weak point but single line pmgs although an improvement cannot get around their low-res horizontal movement. 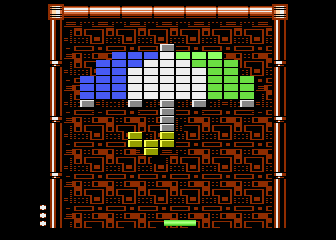 When I was putting some xbios examples together in February this year I created an xbios boot disk to load and save the high score and added that c64 loading pic (that I put together back in 2004). 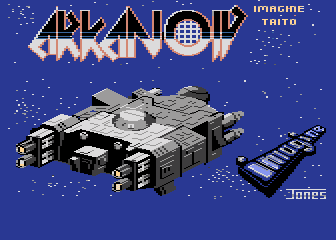 Whilst doing that, for fun rather than using Mark Jones c64 picture I started drawing my own loading picture from scratch based on the arcade graphics with the mothership, vaus and logos. I'm busy finishing off two projects at the moment before jumping into something else though. hm.. i remember about game PAD.. where is topic about that? 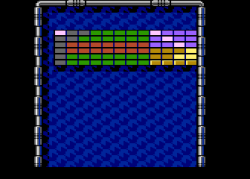 I would add to your design the possibility to have two different color registers changed by DLI's (I did that with my own game). I don't like much the idea of straight ports of these games (when you can have inspiration from all the arkanoids and add some new interesting concepts), but I understand that some people prefer the classic experience. Tezz you're in-game looks great but you can't have that when you start destroying bricks and have bricks and ground at the same lines. From your picture you already lost the 5colours of the ANTIC4 charmode. But then 'How to?' 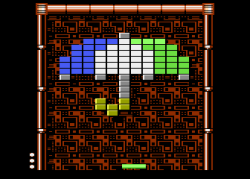 with grounds and bricks at the same scanlines? Diferent and many bricks colours in the same line are what, mid-scanline one of the PFs colour changing (maybe better PF2?) because they are done outside the Bad-Lines where you have black BAK colour register? And if this you still go into 3balls=3Players? 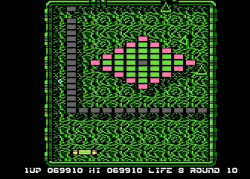 And the Vaus seems software sprite white and gray but then sides are Players more Players for the bonus and then you must put the balls/shots (white?) and enemys as software sprites only? Edited by José Pereira, Tue Nov 19, 2013 10:00 PM. 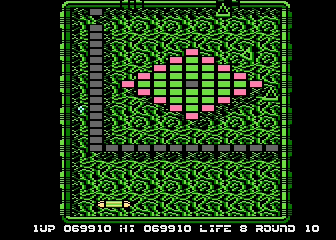 the thing with Arkanoid/Breakout is that the graphics are a false distraction. I reckon anyone could do it if they spent a little time on it. 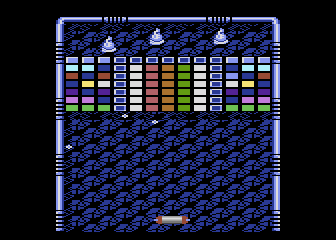 Having written a couple of clones myself I've found the almost impossible part of it is capturing the smooth flowing feeling of playing the original Atari Breakout. It's deceptively difficult. If someone could come up with something with the detail of 'the Pacman dossier' (another game that suffers the same issue) for Breakout and Arkanoid then we could build a game around that and go all-out on the graphics knowing that there was a solid and satisfying game underneath it. Edited by sack-c0s, Wed Nov 20, 2013 8:44 AM. Bonus points if it also covers Revenge of Doh. Wasn't Joust an early try to multiplex PMGs but more than the usual maximum number allowed then we got some/lots of flicker on the birds/enemys? 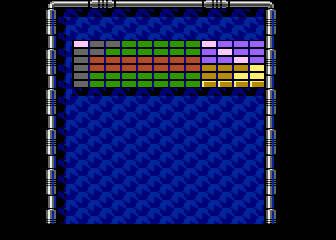 iirc, the 3 balls were 2 pmgs and 2 missiles, 1 pmg was used for more colour options for the bricks with prior0 and it's missile was used quad size to highlight the grey bricks that have to be hit more than once. The remaining pmg and missile is the white highlight on the side borders. The falling objects and laser fire etc would be software sprites. 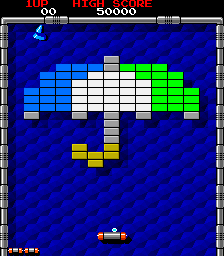 The 2 blues on the background tiles were pf0/1 but I would probably not waste a second colour on the backgrounds and use one for the falling objects or more brick colours. pf2/3 were the bricks (grey and whatever colour). If I also rc, I considered reusing one of the ball pmgs to overlay the falling objects. There's plenty of options to create a better conversion. 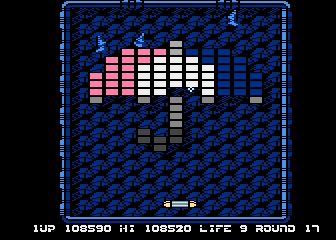 *Edit, I think the two background colours were used because the enemy sprites also made use of them. Also it may not have been the missile highlighting the grey bricks as there can be more than one hit with the 3 balls. I've had a busy day today and too tired to remember exactly. Edited by Tezz, Wed Nov 20, 2013 5:49 PM. As I said, I had a version with some improvements that I didn't release and I have done some more fixes and improvements the last weeks. I want to publish also the source code. Right now I'm thinking about adding some simple enemies or not, before posting the next version (but that would take more time.. is not difficult to do the code, but creating some good behaviors and the graphics and animations take me more time than a real artist x) ). 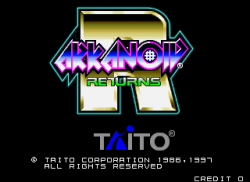 By the way, the code have some small research that I did about Arkanoid 1, 2 and Tournament, because I took and mixed elements from them. I don't see why single missiles can't be use for the balls. 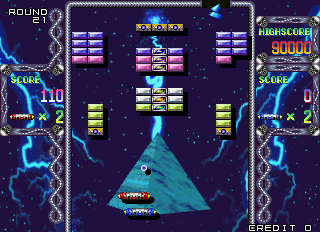 I know it was a feature of Arknoid that the balls didn't look like squares, but I think it's worth the compromise for the Ataris in order to free up the PM's for using elsewhere. They're such a small graphical element in the game, physically, compared to everything else. Edited by MrFish, Thu Nov 21, 2013 1:17 AM. Joust uses a good PM multiplexor (players for birds, missles expanded for weapons) and ring buffer. should be same technique like Mrs Pac Man. 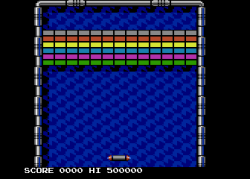 I tried to recode the plexor but always failed the whole screen is bitmap mode so you can set DLIs dynamicly. Would the extra corners affect collision detection due to its slighty greater cross-section? Affect it in what way? Programmers have the liberty to set up collision detection in whatever way is necessary. 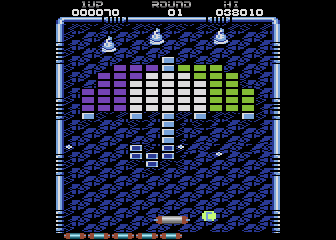 In this case the collision registers, which are based on pixels, could handle it. Nothing major, was just wondering if the ball (or square!) hitting the edge of the bat at an angle making the difference between a hit or miss due to the shape having corners now. I guess you mean when changing an existing version over to use 2 pixel wide missiles as I've suggested. It depends on the method used for collisions in the first place. Like I said, P/M's can use the registers, so it wouldn't make any difference in that case, because it's detecting overlapping pixels for whatever shape they happen to be.